Pierate - Pie Reviews: Who Rate All the Pies? The answer to the question is of course us! At nearly 600 pie reviews we are leaders in the pastry consumption field. I am going to take the opportunity for a bit of light hearted 'dissing' of the com-pie-tition in the way rappers might diss each other. I know this might seem a bit harsh given that Pierate is a family friendly site but sometimes a Pierateer has got to do what a Pierateer has got to do. I was a bit bemused to today to be sent a link to this article from that ever enlightening newspaper, The Sun. It is about a fellow who who runs a blog called The Pie Pundit who apparently 'rate all the pies'. He has been reviewing football pies since 2011 and has got to the grand total of 'around 50' of the 92 football league grounds. I will clarify that I do enjoy looking at his website as it is nicely laid out with pictures of different football pies. However, this article really got my goat because I cannot understand how this possibly made it as so called 'news'. Even by a normal person's standards (as in, someone who isn't a pie obsessed manic like us), is it really that impressive to eat 50 pies in 5 years? That is less than 1 pie a month! Tom Dickinson has already done all the football league grounds in ONE season in '92 pies' for crying out loud! In the article, Jonny Smith (if that is his real name, it sounds suspiciously generic) says it is 'his life long goal to find the best'. I am glad it is his life long goal as it's going to take him a long time at this rate. What gets me the most is that he hasn't gone out of his way to find the best pies because he hasn't even been to Morecambe! 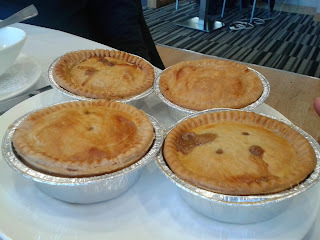 Multi-winners at the British Pie Awards, they are regarded by many (including ourselves) as having the best football pies. Head chef Graham has made many media appearances, including featuring in this BBC Sport video with ourselves. Not visiting Morecambe is like saying I have found the best Pizza in Europe.... oh but I haven't been to Italy. Lastly, something that will always prevent me from taking the Pie Pundit too seriously is that his number 3 is a Cottage Pie from Fulham, a product which is not even slightly related to our favourite pastry product. The fact that it completely lacks pastry isn't even mentioned in his brief article! I said lastly but I have just remember another thing that has got me wound up! He recently reviewed a burger.... yes, that's right, a burger. Plus he only wrote two sentences in his review at our beloved Wycombe Wanderers.... how can two sentences count as a review? Okay... I really will stop now. P.S. Great work Jonny, we love it really. I am just bitter because you have reviewed more football pies than we have in our Football Pie League (the other half doesn't let me go to the football very often...). What happens at a Pierate Piefest? MyPie are my number 1!